Our point is that for this entire season we have stood by and allowed an issue of some importance grow until, with the latest creation of yet another “National Champions” hat and t-shirt, the issue has become a carbuncle on the posterior of Wool E. Bull. Therefore, let it be said that we did not allow the entire season (just most of it) go by without alerting our readers to this salient feature of Triple-A baseball. The National Championship is bogus! I mean, one game in the middle of September, in a town where nobody cares. Give me a break. There. We’ve said it. Move on. Wish that we could. Can’t. Because the Governors’ Cup (International League Champions) competition is real. The Bulls are looking to be the South Division champions of the International League and once again in the hunt for the Cup. The Governors’ Cup isn’t bogus, isn’t a scam, isn’t a marketing gimmick. And it is a whole lot prettier to boot. The tickets to the playoffs went on sale yesterday (season ticket holders have already had their shot). If previous years are any example, there won’t be a great demand, but you never know. Which leads me to my main point: The most important game of the year for the Durham Bulls (assuming they are the South Division champs) is Friday, September 10. Get your ticket now. Here’s why. For the first round of the Governors’ Cup playoffs the South Division champs play a best-of-five series with the West Division champs. The first two games at the West team’s home, followed by up to three games at the South team’s home. So, assuming it’s Columbus and Durham, two away games on 8-9 September, then the Bulls come home for the 10th. They will be either 2-0, 1-1, or 0-2 at that point. In any circumstance it will be a crucial game and we should all be there. We will, won’t we? 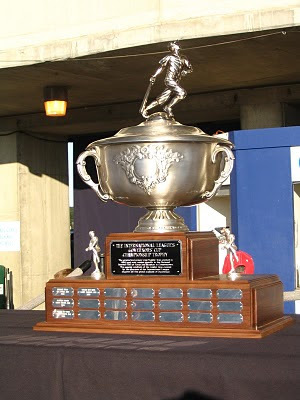 Why is it called the Governors’ Cup? (Note the location of the apostrophe.) Because back in the 30’s the governors of Maryland, New Jersey, and New York and the Lieutenant Governors of Quebec and Ontario sponsored the first trophy for the International League playoffs. Thus, more than one governor involved. I hate that the game is always in Oklahoma City every year. The people there can't really care that much, plus it is always an advantage for the PCL to play in a stadium they know. I wish they would rotate it yearly like the All-Star game, alternating between PCL and IL sites. I know that I would certainly go to a game here, even if the Bulls weren't in it if it wasn't going to be back here for many year. Just makes sense that way. My fundamental problem with it is that in baseball things are never decided by just one game. So the idea of a one-game "championship" just doesn't make sense. Lot's of other problems with the game — location, lack of support by MLB, etc. Basically, it's just a marketing gimmick that benefits only one team. On the other hand, the Governors' Cup is a legitimate championship. I'd be much prouder of a G-Cup t-shirt, but they were only on sale last year for about a week, and I didn't get one. Wish I had.